South Beach, also nicknamed SoBe, is a neighborhood in the city of Miami Beach, Florida, located due east of Miami city proper between Biscayne Bay and the Atlantic Ocean. The area encompasses all of the barrier islands of Miami Beach south of Indian Creek. This area was the first section of Miami Beach to be developed, starting in the 1910s, due to the development efforts of Carl G. Fisher, the Lummus Brothers, and John S. Collins, the latter of whose construction of the Collins Bridge provided the first vital land link between mainland Miami and the beaches. The area has gone through numerous artificial and natural changes over the years, including a booming regional economy, and increased tourism. 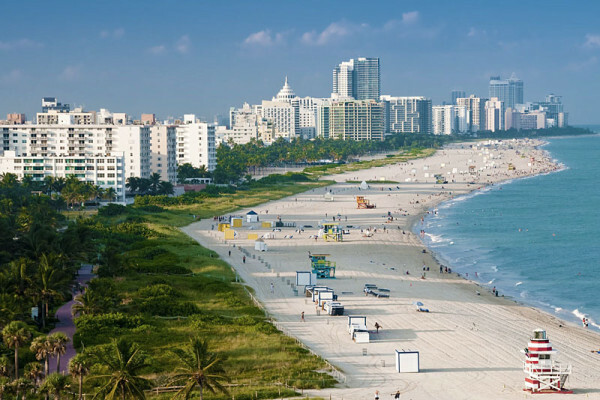 As of 2010, 39,186 people lived in South Beach. In both daytime and at nightfall, the South Beach section of Miami Beach is a major entertainment destination with dozens of nightclubs, restaurants, boutiques and hotels. The area is popular with tourists from New York, California, Canada, Europe, Latin America, Russia, China, Israel and the entire Western Hemisphere, with some having permanent or second homes. Immortalized by movies, TV shows, and one that’s been both, South Beach is Miami’s scene-stealing sultry star. When it comes to sunning, shopping, dining, and dancing until tomorrow morning, prepare to indulge. No matter how many senses you have, South Beach stimulates them all. Sleep? You can do that on the plane.